In 1831 John Glover arrived in the Tamar River, Launceston after a five month journey from England with his wife Sarah, and son John Richardson Glover. 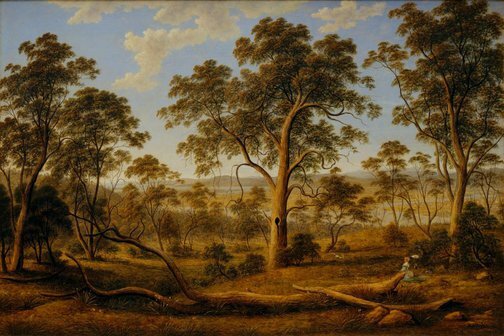 This painting dates within the first years of Glover's arrival in Australia and testifies to his desire to capture the unique environment he encountered. A Colonial Landscape, with minutely painted foreground. Love birds on the trees, & c.
Signed l.r., brown oil "J Glover". Not dated. Andrew Frost, Conquest of space: science fiction and contemporary art , 'The engine of experience: contemporary art and SF', pg. 5-7, Sydney, 2014, 6, 12 (colour illus. ), 43. John McPhee, Art Gallery of New South Wales collection series , 'John Glover: Ullswater from Patterdale', Sydney, 1981, illus..
Daniel Thomas, Art and Australia , 'Australian collection', pg. 52-62, Sydney, Jul 1972, 53 (colour illus.). The Art of John Glover , Melbourne, 1980, 26, 69, 88 (colour illus.). John Glover , Launceston, 1977, 38, 43, 45. Four Colonial painters 1832-1887 , Lindfield, circa 1980. The Australian eye series is an historically grouped series of films on Australian painting made by Film Australia with the co-operation of the National Gallery and the Art Galleries in each state. Each program takes a major work of each of the particular artists from the period concerned, and examines that work in detail. Art and Australia , Sydney, Jul 1972, 1 (illus.). The old English landscape painters; vol. 5 , England, 1959, (illus.) (plate 211) as 'Near Launceston, Tasmania'. Australian Encyclopaedia Vol. 6 , Sydney, 1996, 2330 (colour illus. ).